Control4 is a control system that coordinates all the technology in your home into complete, brilliant experiences—interactions that fit your lifestyle and are easy for your family to enjoy. With one touch, dim the lights, play music, turn up the heat, lock the doors and arm the security system. With Control4 you can check on your home from your smartphone, no matter where you are. It’s a smarter living experience that you’ll wonder how you ever lived without. Entertainment is made easy too. Fill one room or every room with your favourite high-definition content. From watching the latest 4K movies to streaming CD-quality music, you can enjoy limitless entertainment with a single remote or create an unrivalled home theatre experience. It’s simple, clean and clutter-free entertainment—right at your fingertips. 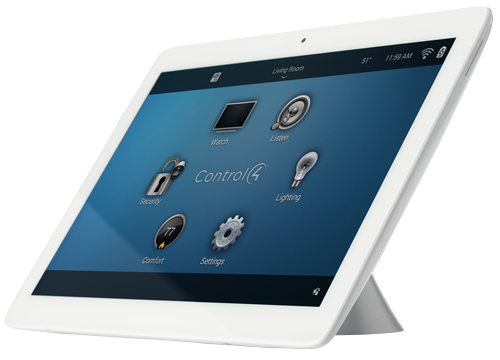 A Control4 automation system is custom built to fit around your lifestyle and needs. Whether you are looking to automate a single room or you are designing your dream home, Azro will help you identify the automation features that you will enjoy and use regularly. As a Gold Dealer, part of Control4’s Premier Dealer program, we have an in depth understanding of the Control4 product suite and can tailor the correct products to suit your requirements. Azro are certified and authorised Gold Control4 dealers. Our engineers provide the full service incuding; consultation, design, supply, installation, testing, troubleshooting, repair, training and support.